There is a story told of a woodcarver commissioned to carve a large carving for a church in Europe. the carving was vast and reached up to the highest parts of the church. One day, a priest saw the carver near the top working intensely on a part of the carving that was completely obscured from view when seen from the floor. The priest was curious and decided to scale the scaffolding to see what this carver was doing. When the priest finally reached the top, he could see that the carver was carving exquisite detail into the face of an angel, that no one would ever be able to see. The priest asked the carver why he was spending so much time and effort on this detail that would remain unseen once the scaffolding was removed. 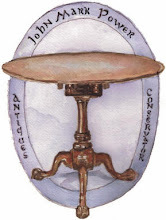 The carver's reply to the question was " Because God knows it is there." While I am by no means known for my exquisite carving of angels, This story has been rattling around in my head for the past few weeks. 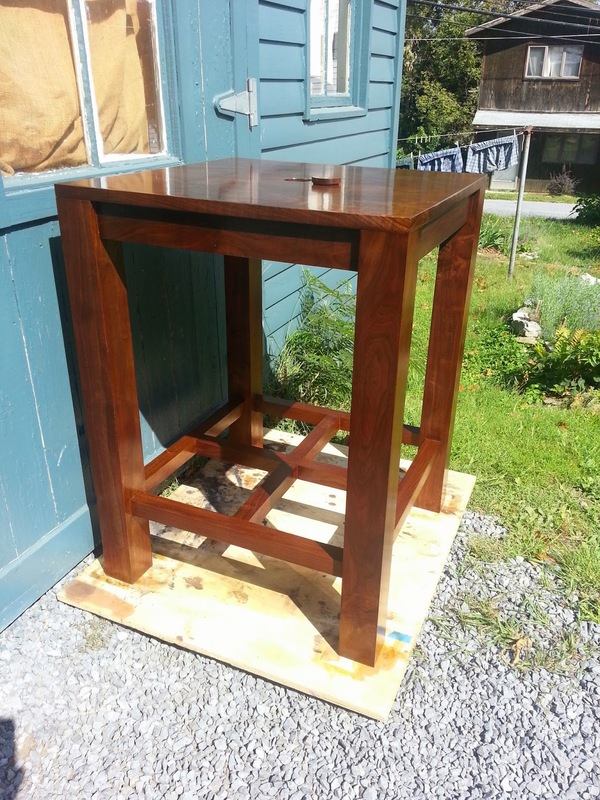 The reason for this is that I was asked to build an altar for The Holy Trinity Orthodox Church of Reston, Virginia (http://www.holytrinityvirginia.org/). The church furnished photos of the altar they had in mind as well as the dimensions that were needed so that they could use the vestments from their old altar. I was told that once the altar was delivered it would be consecrated and then covered by these vestments. Once the vestments were on they would cover the altar completely and rarely by taken off. With this in mind, the question in my mind was how much time I should and effort should I go through to make this altar a beautiful thing to behold? 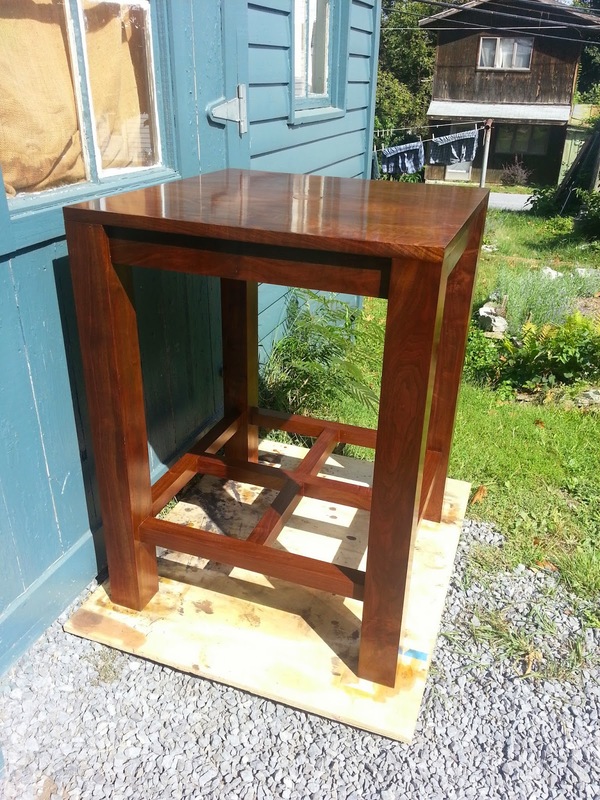 Using sound joinery techniques and solid, strong timber were a must for the structural integrity and function of the piece, but beyond that, how beautiful should it be if it will be forever covered? The decision was really not mine to make at first, and I offered several wood choices to the church, of which walnut was decided on as the wood to be used. 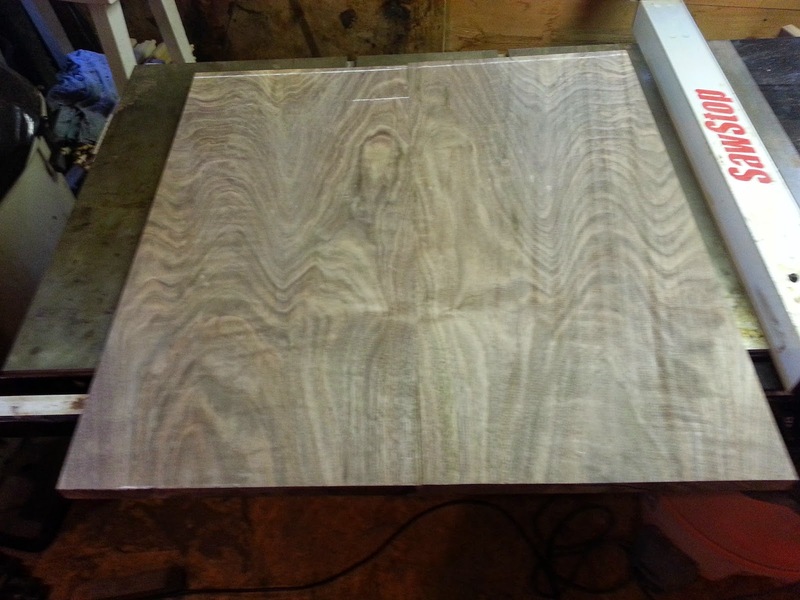 Walnut is a naturally beautiful wood and because of this choice, I new that I would be making something fine. But in addition to this in the back of my head, I kept telling myself the story of the wood carver. Of course this should be a thing of beauty. God will most certainly know it is there! With this in mind I furnished drawings based on the photos the church had presented to me. The altar was completely rectilinear in form, and followed traditional orthodox designs that go back hundreds of years. Below are the initial drawings of the altar rendered in Sketchup. One change that was made later that is not seen in the drawings is the inclusion of a reliquary, a vessel used to house a relic which was inlayed into the top of the altar. The design and creation of the reliquary is detailed later in the post. 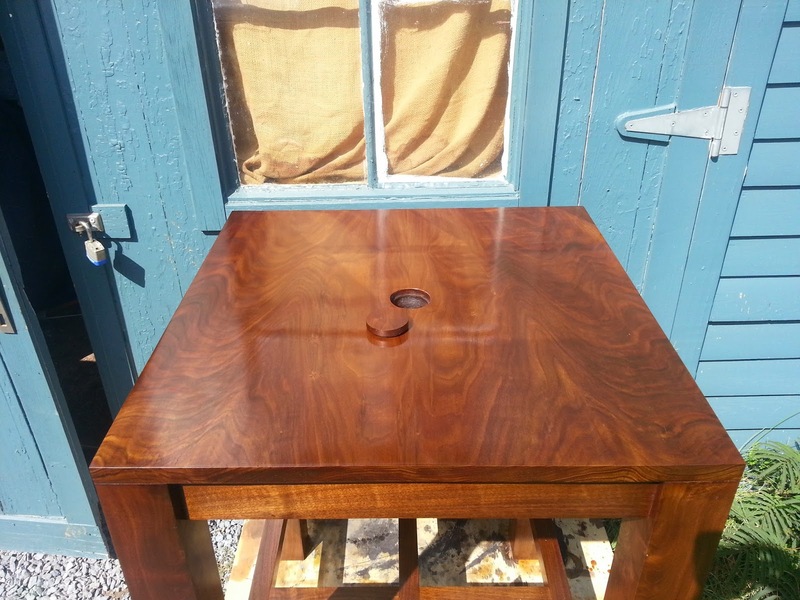 Once the wood was selected, it was milled to the overall dimensions necessary. 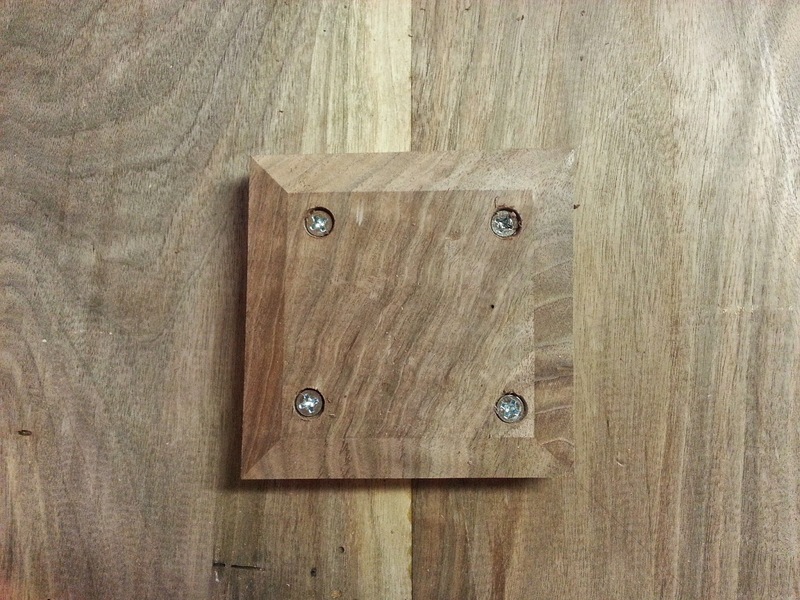 Below is a photo of the milled walnut used for the altar. 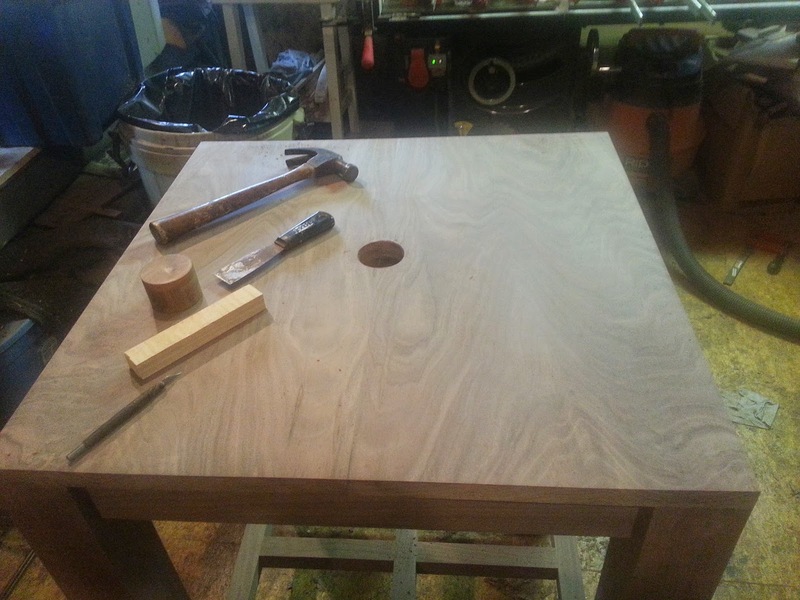 I started with the base and cut all of the tenons using techniques on the table saw which I have detailed in other recent posts. 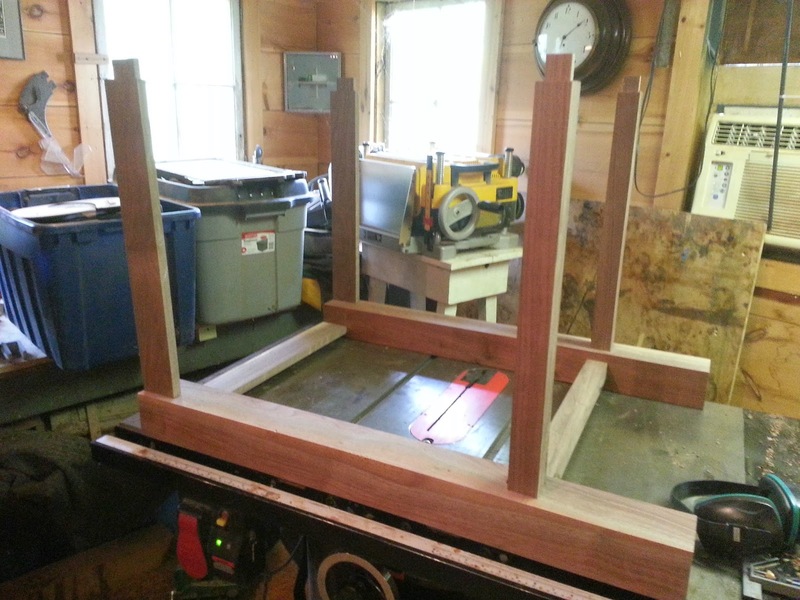 Below is a photo of all of the stretchers and apron material with the tenons cut. 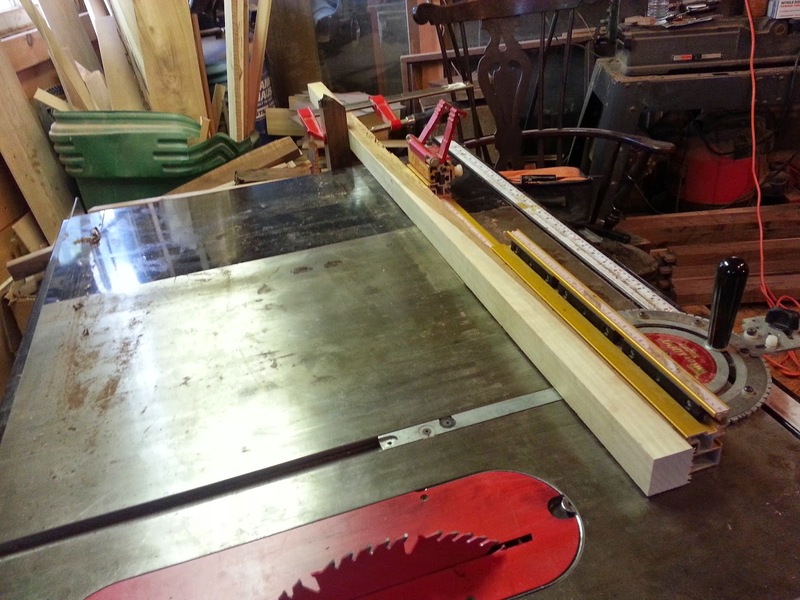 To cross cut the legs, which were 38 inches long, I modified my cross cut gauge to accommodate the long boards. This was done by attaching a long board used to support the legs while the cuts were made. The gauge is seen below with the board attached. 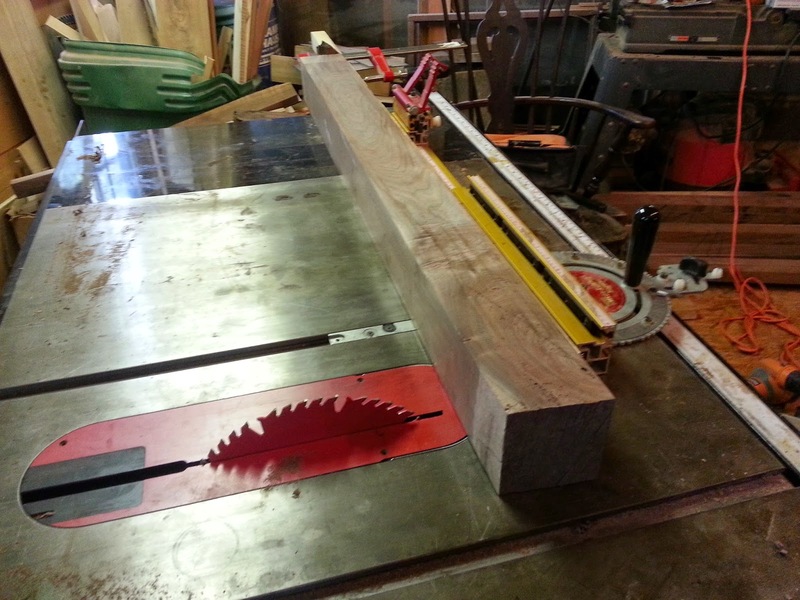 The following photo shows one of the legs being cross cut. 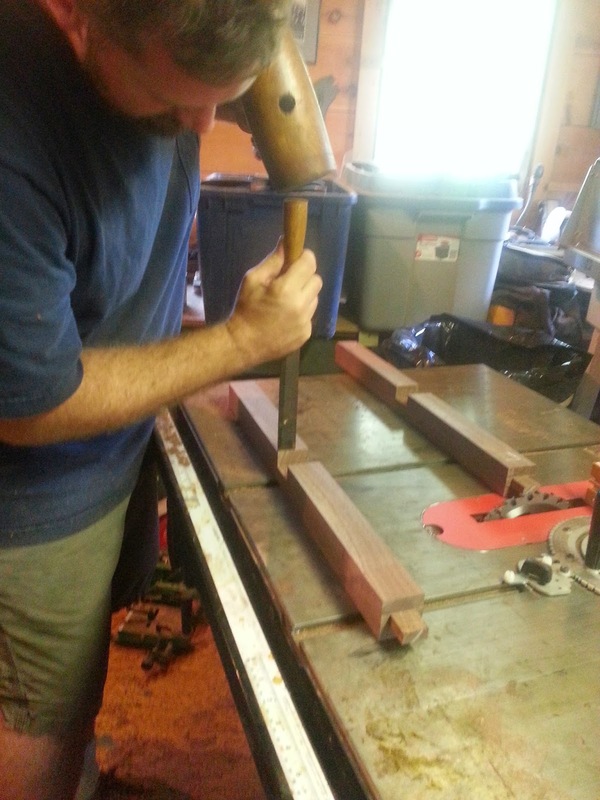 I also clamped a stop block on the end so all of the legs would be cut to the same length. 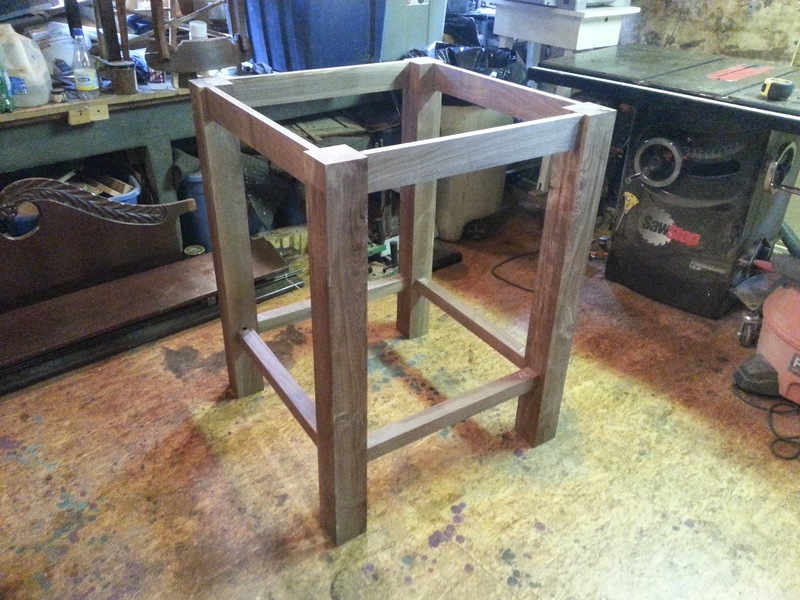 After the legs were cut to length, The next step was to cut all of the mortises into the legs to receive the tenoned aprons and stretchers. For this I utilized my mortising machine, which allowed this work to be done quickly and accurately. 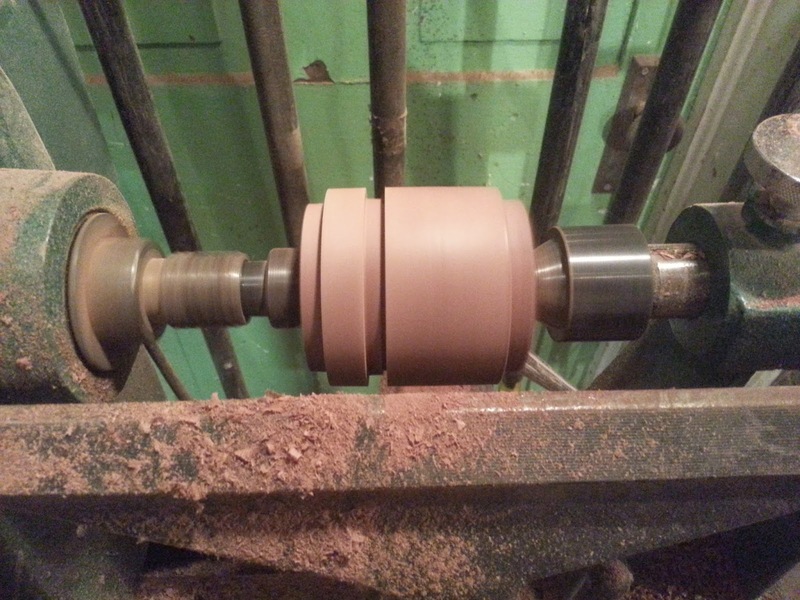 Below is a photo of one of the legs on the bed of the machine followed by a second photo showing one of the cut mortises. 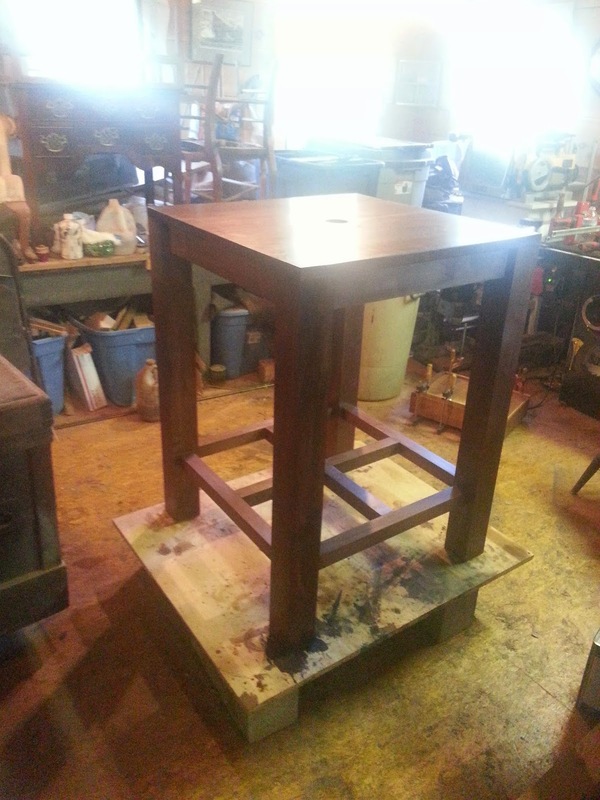 After all of the mortises were cut, I test fit the legs and stretchers to make sure everything was accurate and square. When I went to the sawmill to select boards for the top, I was thinking that if I was able to get three wide boards for the top, that would be good and I would be lucky. Most likely I would have to settle for four boards.I asked the sawyer to show me some boards that would allow for this. 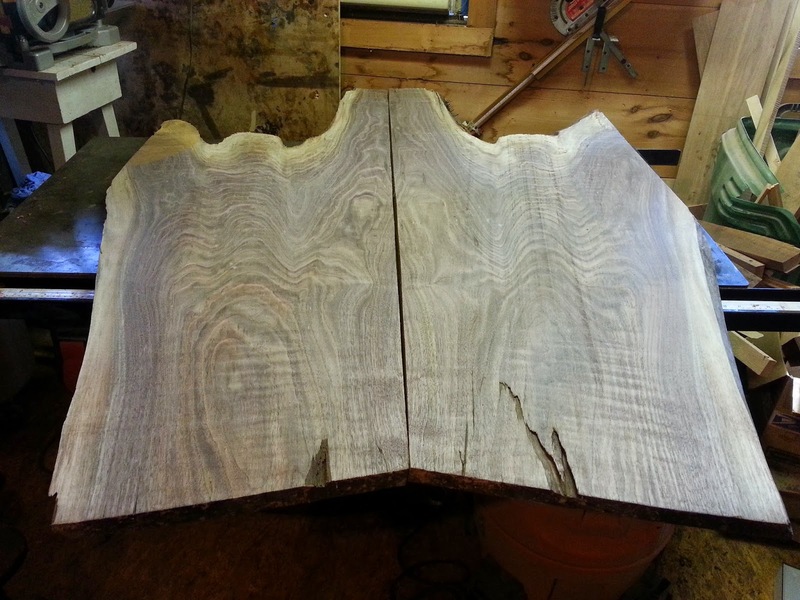 Almost as an afterthought, he pulled out two natural edge slabs that were bookmatched. 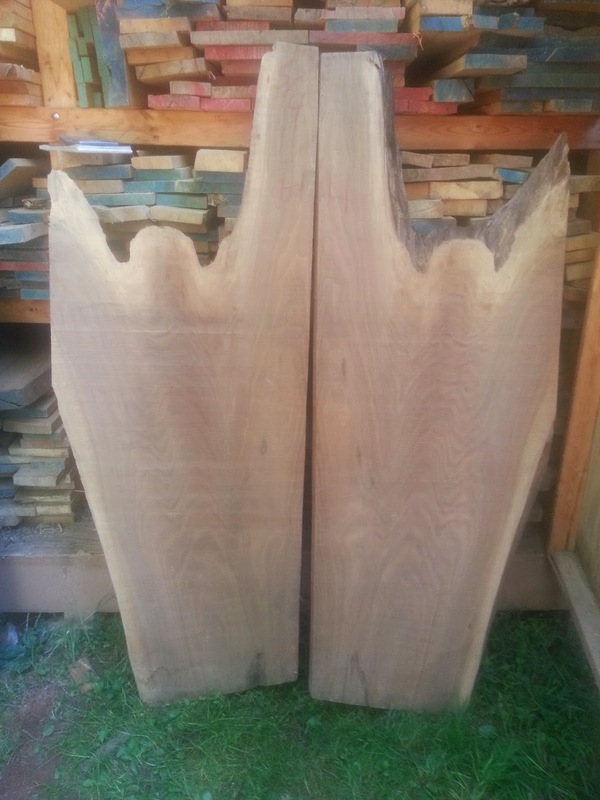 I saw these boards with curly flowing grain and I said " That is the top!" 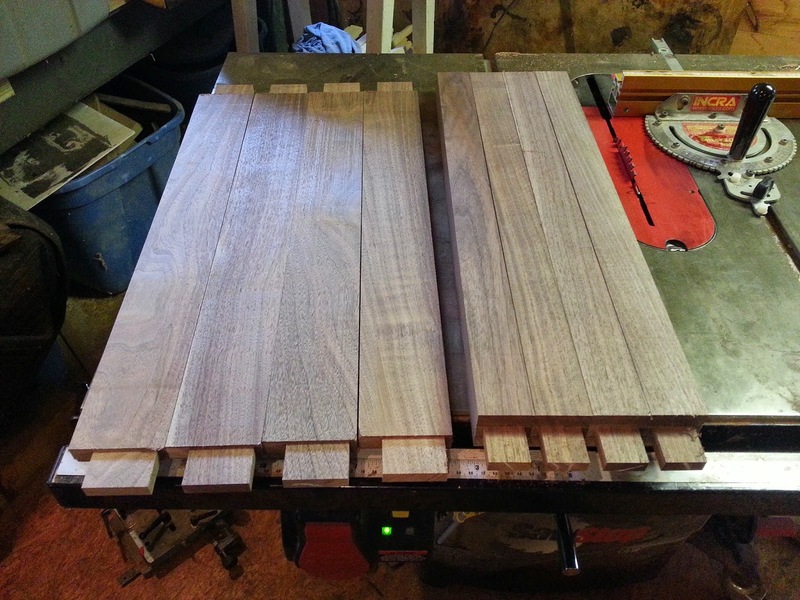 I measured and found that the boards were more than adequate for the dimensions I needed. 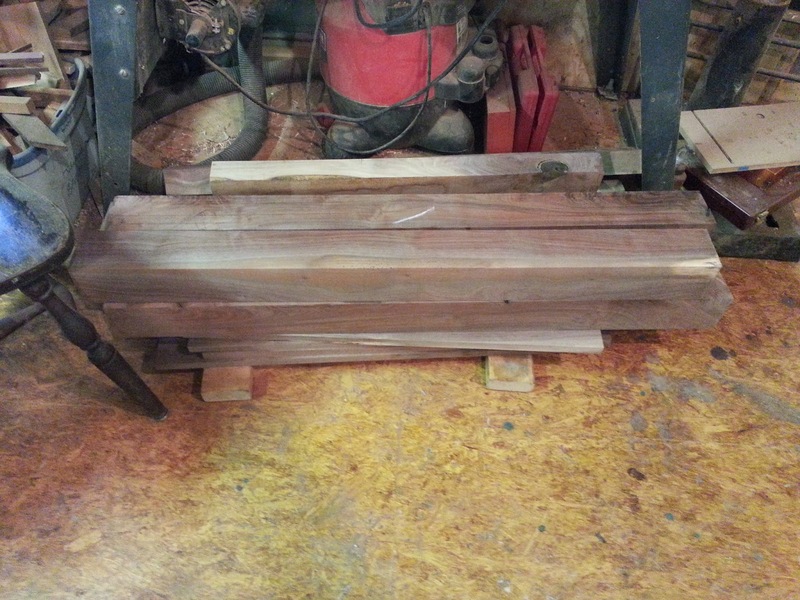 Below is a photo of the boards as I saw them at the sawmill. 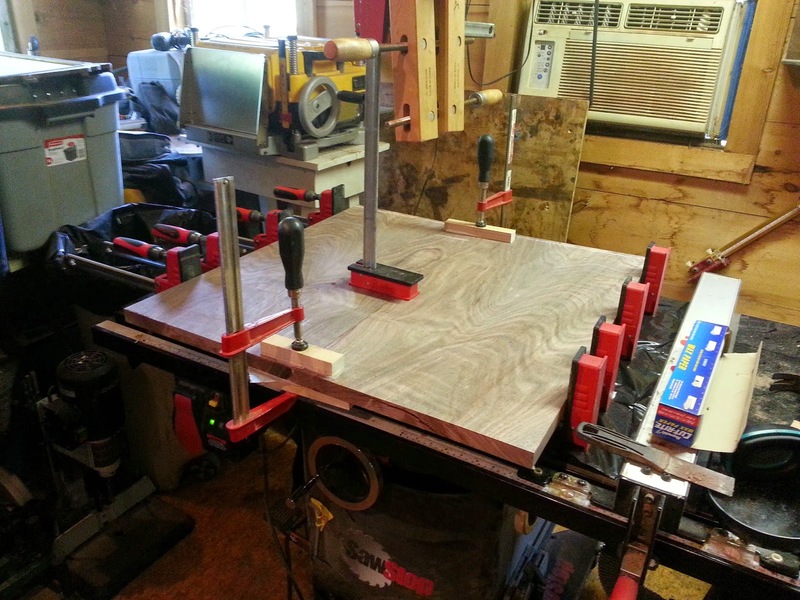 Once back in the shop, I needed to make these boards square and to the right dimensions. after a little wrangling, I got the boards where I needed them to be. 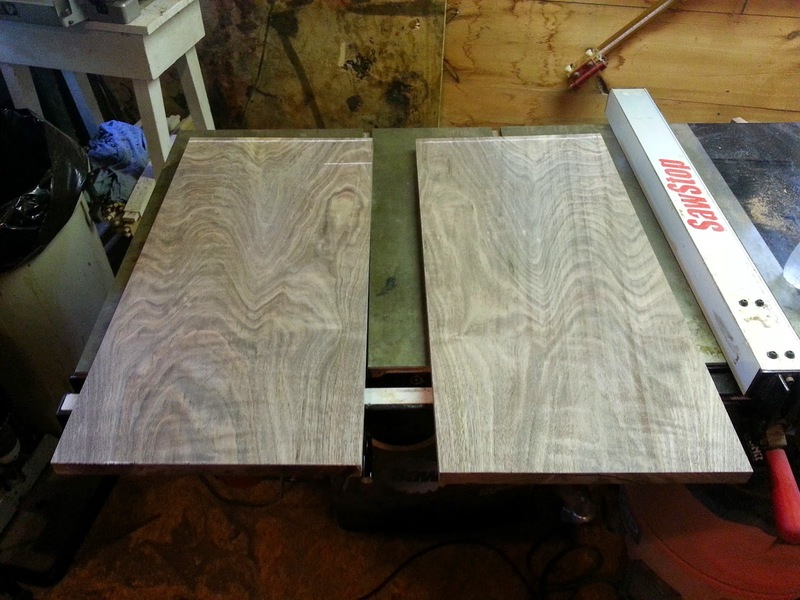 Here are two photos showing the boards before and after dimensioning. When joined, the boards had great flow and seemed to be one board, as seen below. This next photo shows the top being glued together. 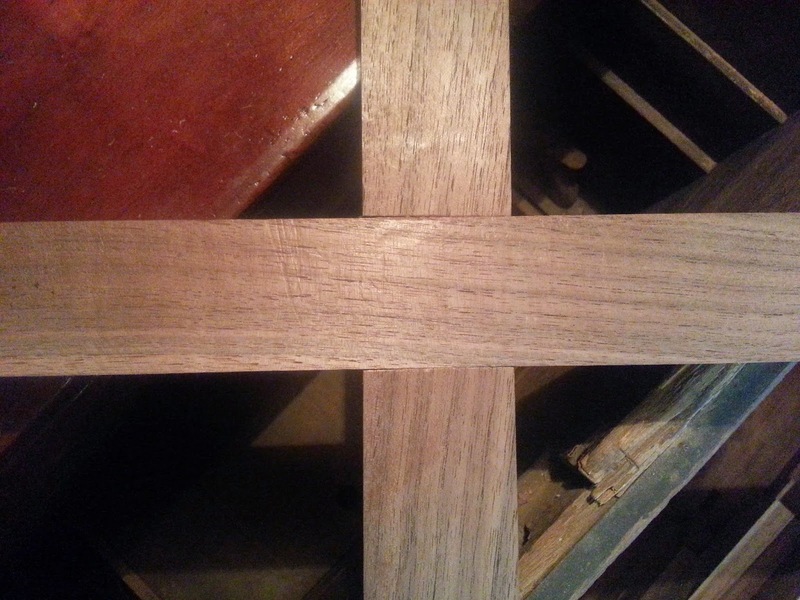 The last piece of the altar that needed to be made were two cross stretchers that would intersect in the middle making a cross shape. the joinery at the intersection was lapped and below is a photo of me cutting to the line scribed where the two boards intersected. A detail of the finished joinery is seen in the next photo. 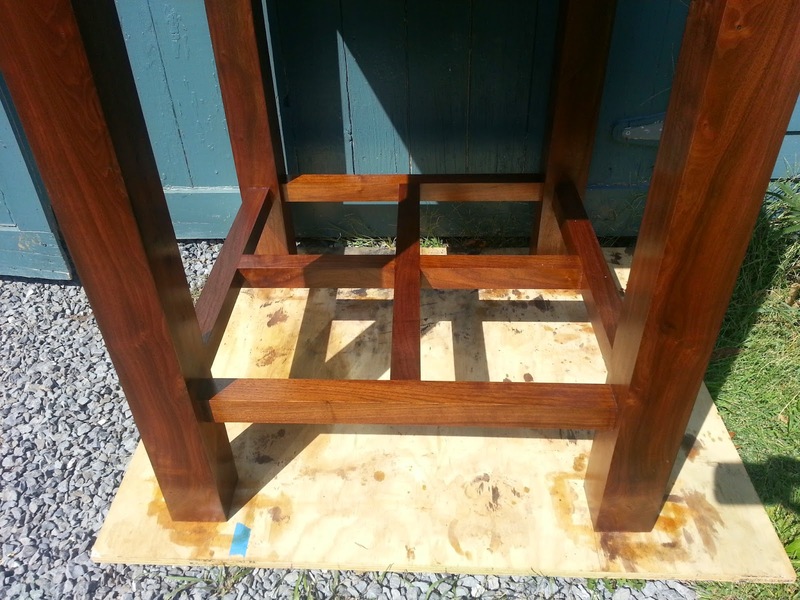 This is followed by a photo of the base of the altar being glued. As I was getting ready to finish the altar, the church asked if I would be willing to add the reliquary mentioned above to the piece. I came up with a plan that involved adding a bit to the center of the top on the underside of the top to house the reliquary, as seen below. I started with a discarded cut off from one of the legs, which I cut into a two and a half inch cube. 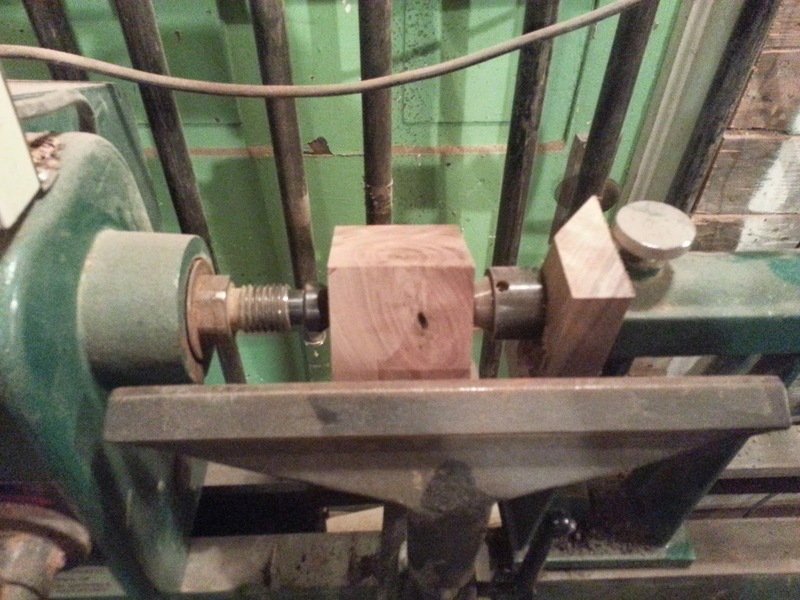 I then mounted the cube between centers on the lathe and turned it to a cylinder. 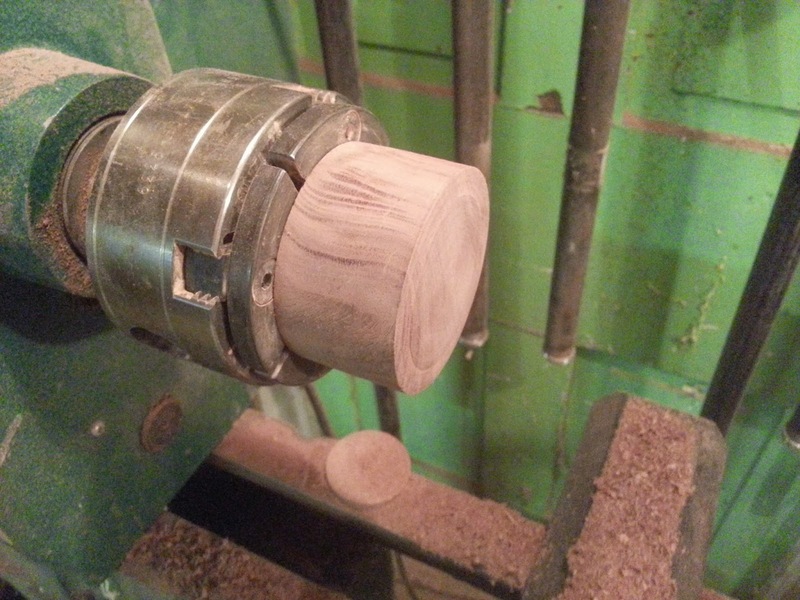 The diameter of this cylinder was dictated by the hole saw I would later use to cut a hole in the center of the top. 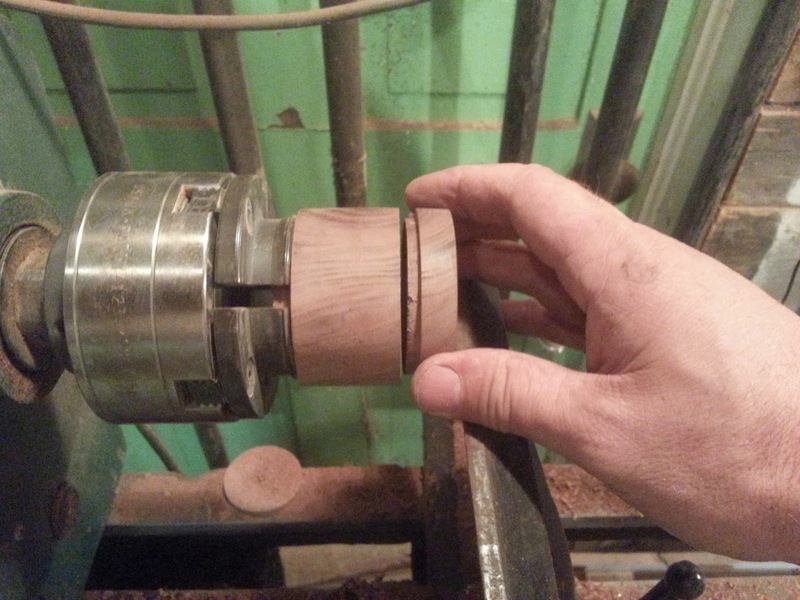 To test the diameter for a good fit, I cut a hole in a scrap piece of wood and used it to fit the cylinder. 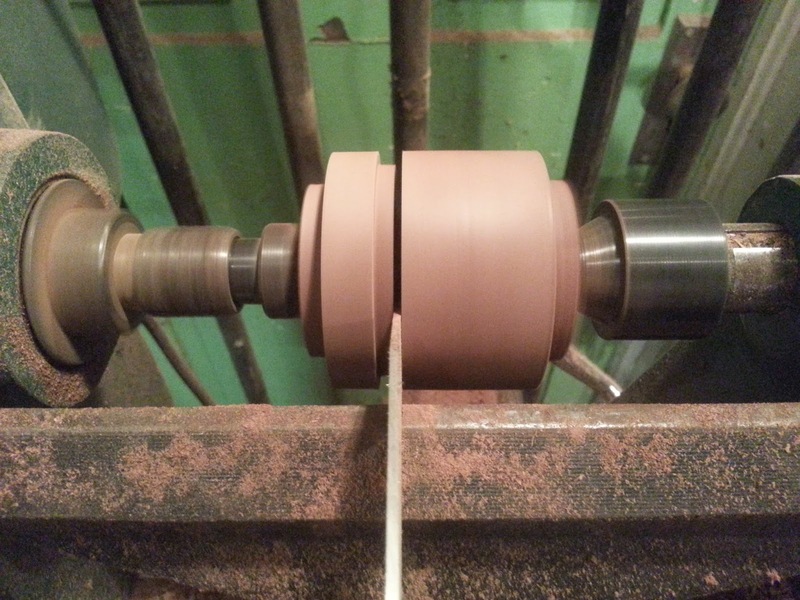 Below is a photo of the square blank and then the turned cylinder. 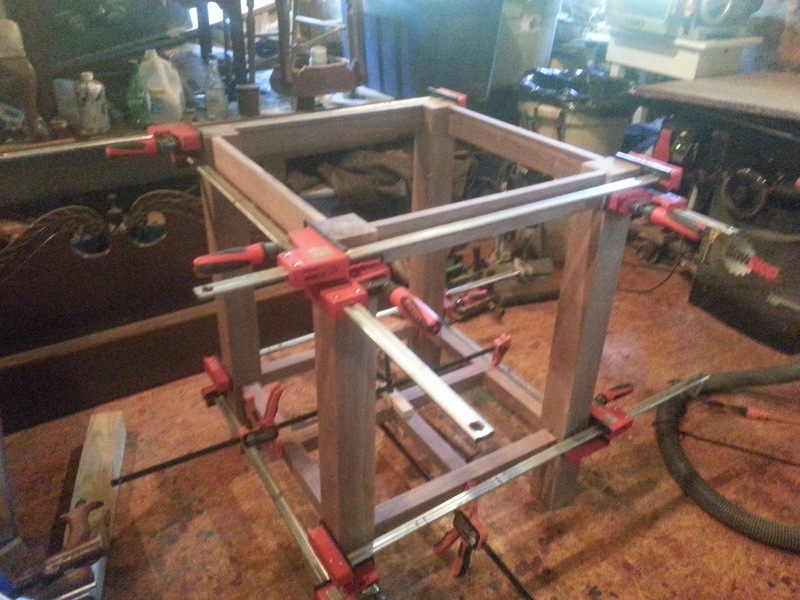 The next step was to turn two tenons on either end of the cylinder. 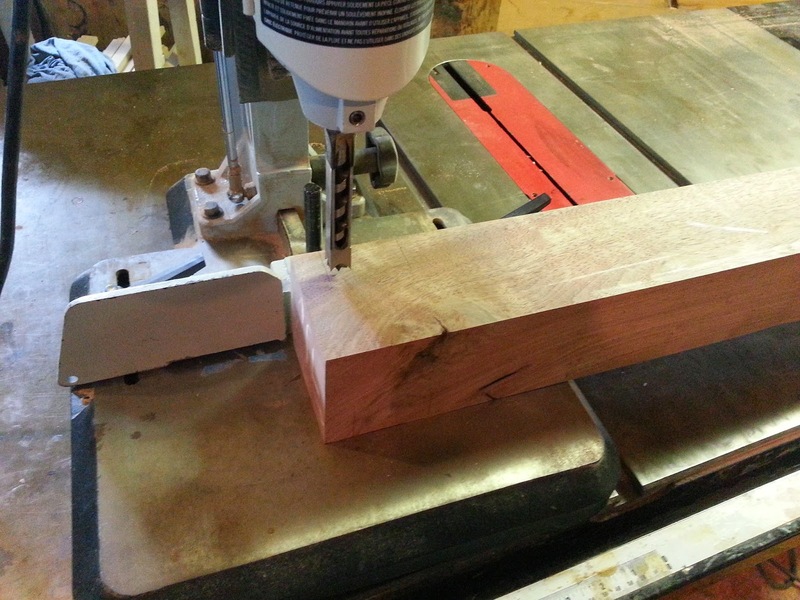 These tenons would allow me to grip the cylinder using a chuck from either end. 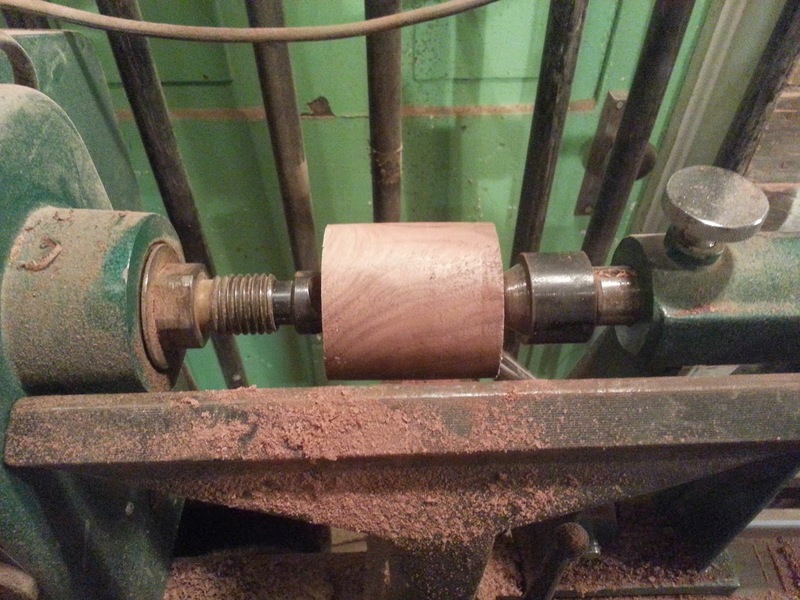 Using a regular parting tool, I then cut into the cylinder about a third of the way in from one side. This gave me a visual understanding of the top and the base. 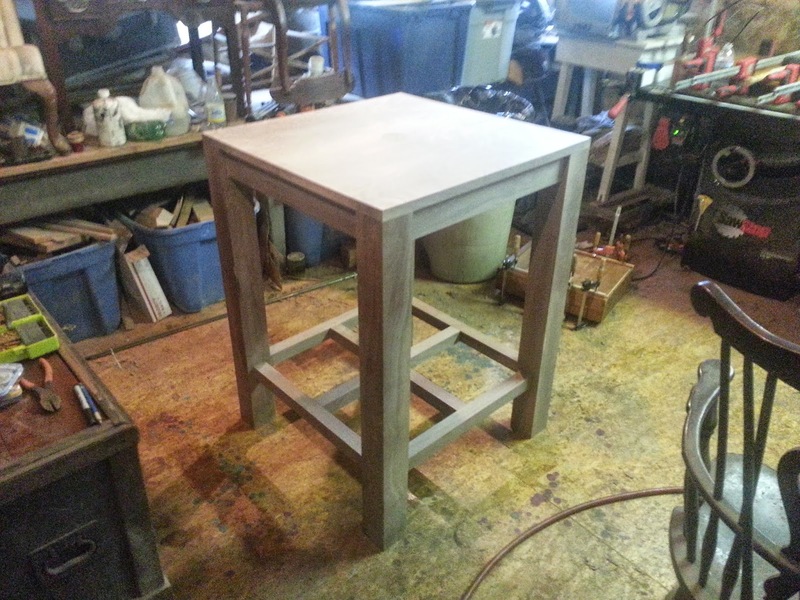 This also created a lip for the top to fit into the base later. This stage can be seen below. 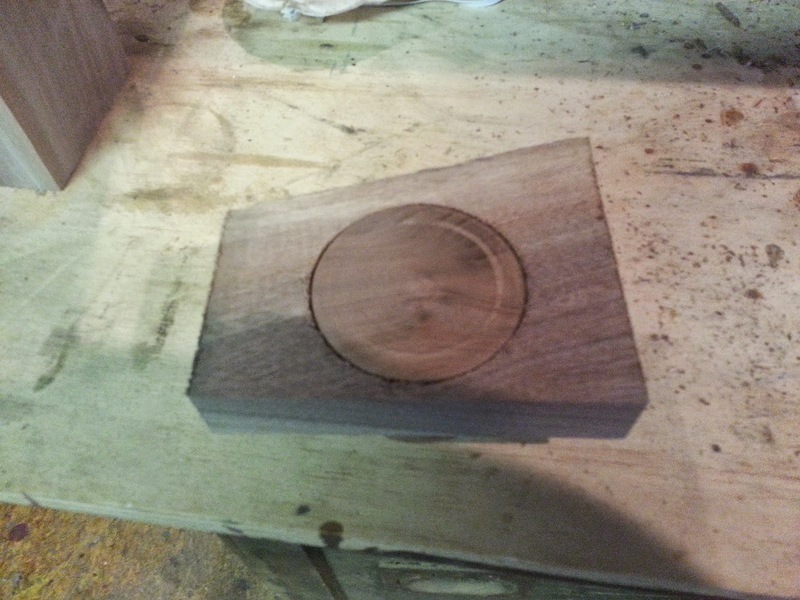 Using a very narrow parting tool, I then separated the top from the base, as seen below. 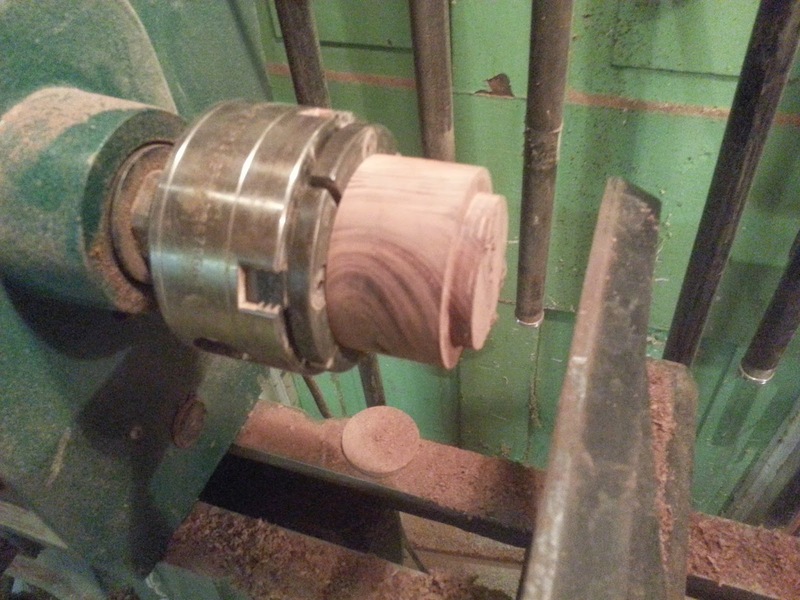 With the chuck mounted on the lathe, I inserted the top in the chuck and refined it. 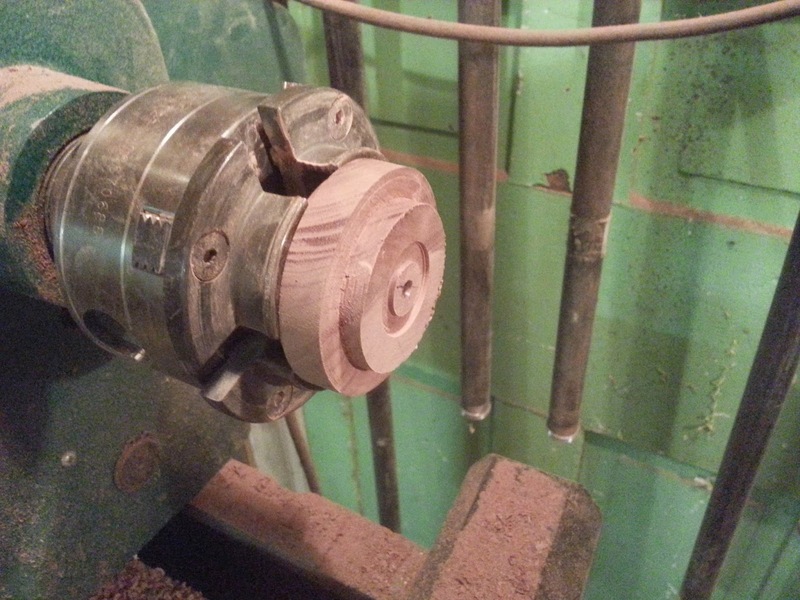 Once I felt it looked good, I dismounted it from the chuck and used the lip I had created to hold the top so that the tenon on the end could be parted off. This can be seen in the next two photos. 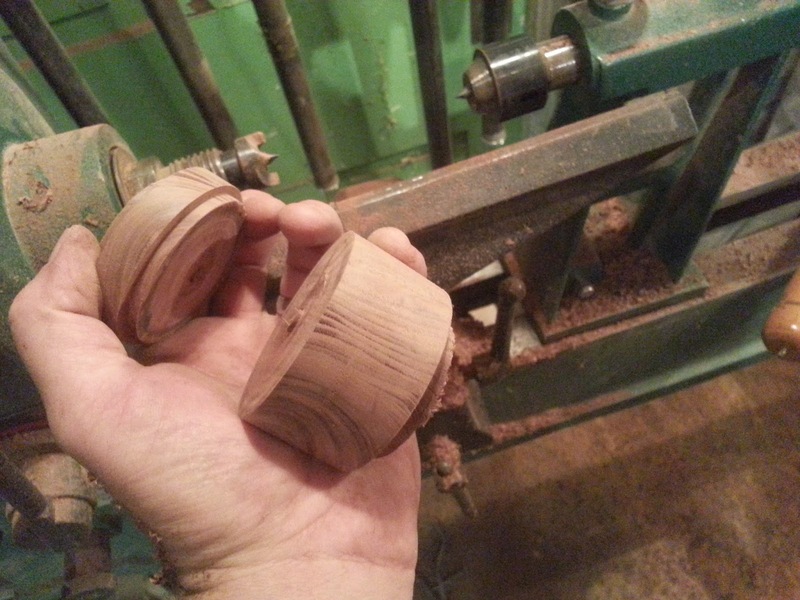 Once the top was completed, I then put the base in the chuck and hollowed out the inside of the vessel. 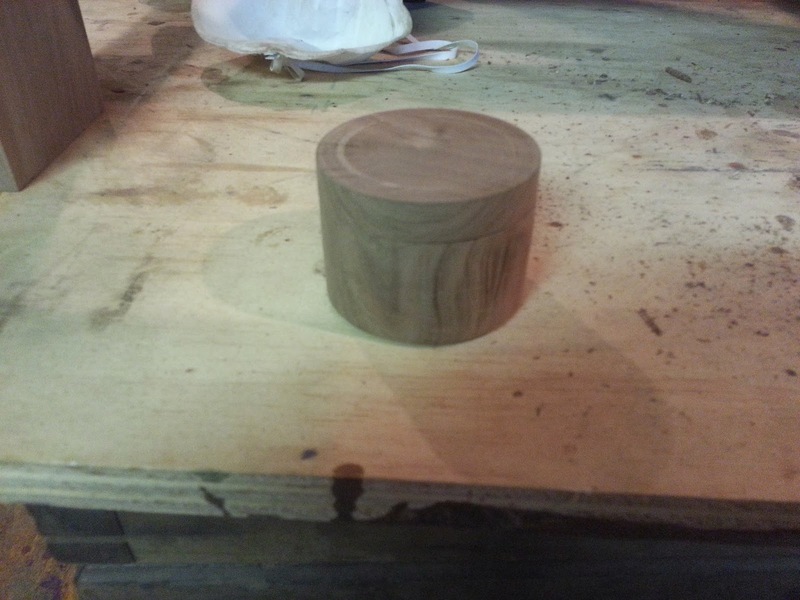 Where the lip on the top would fit into the base, I used extra care to make sure it was a good fit. 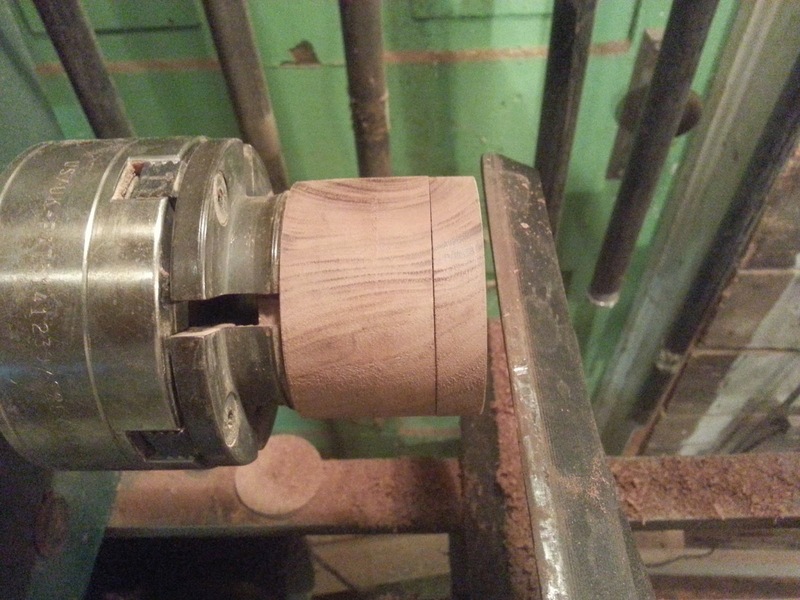 This required me to periodically stop the lathe and fit the top until it was just right. The next two photos show me fitting the top. Note how in the first photo the grain flows from the top to the base. 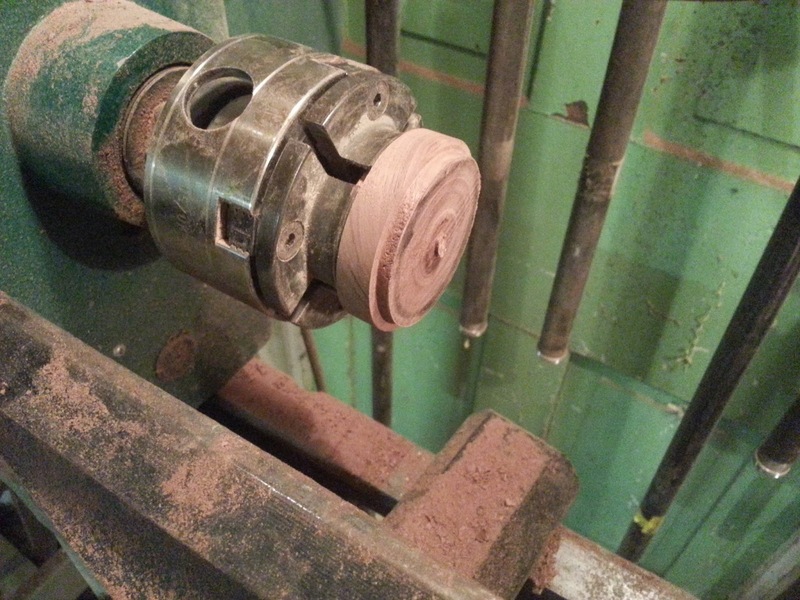 After the hollowing was completed I turned the base around and expanded the jaws of the chuck into the inside of the vessel, until the jaws held the vessel tightly. 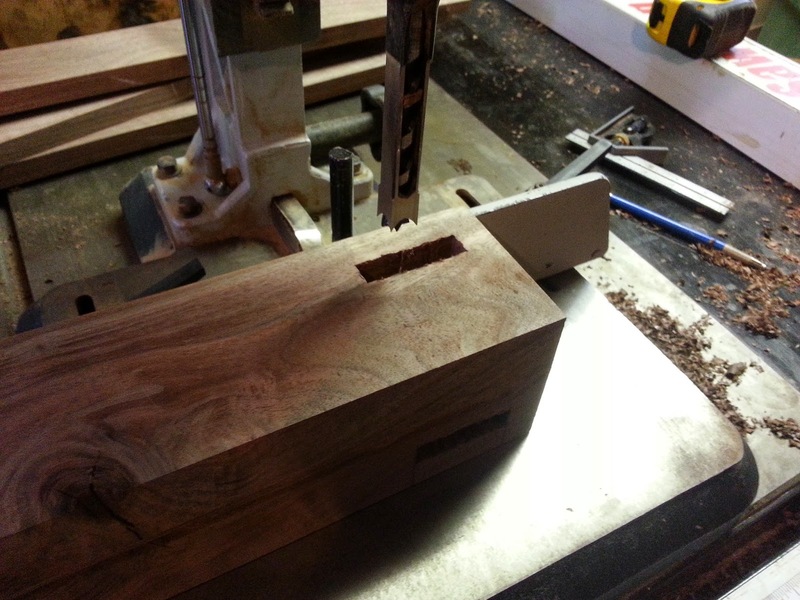 I then parted off the tenon at the bottom of the base, as seen below. 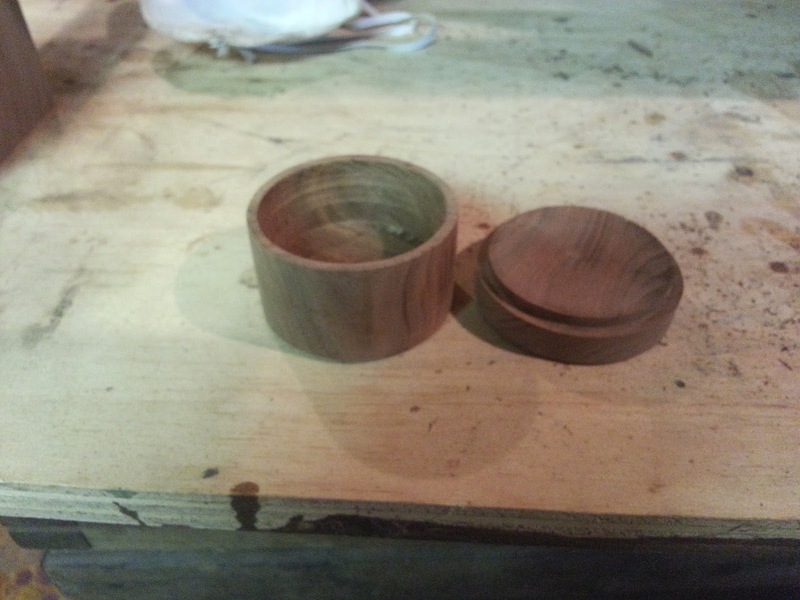 These next photos show the completed cylindrical box. The third photo down shows the box fit into the scrap piece I cut a hole in. 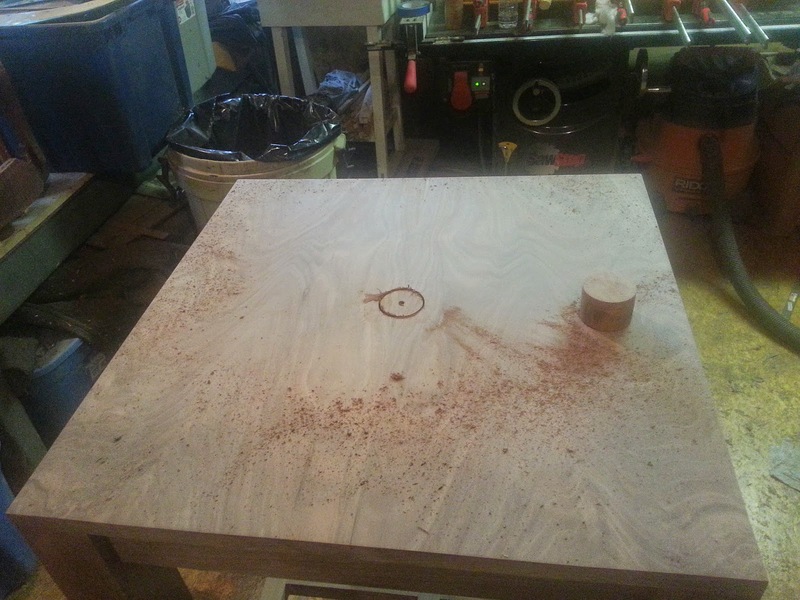 The next step was to cut a hole in the top of the altar in the center. 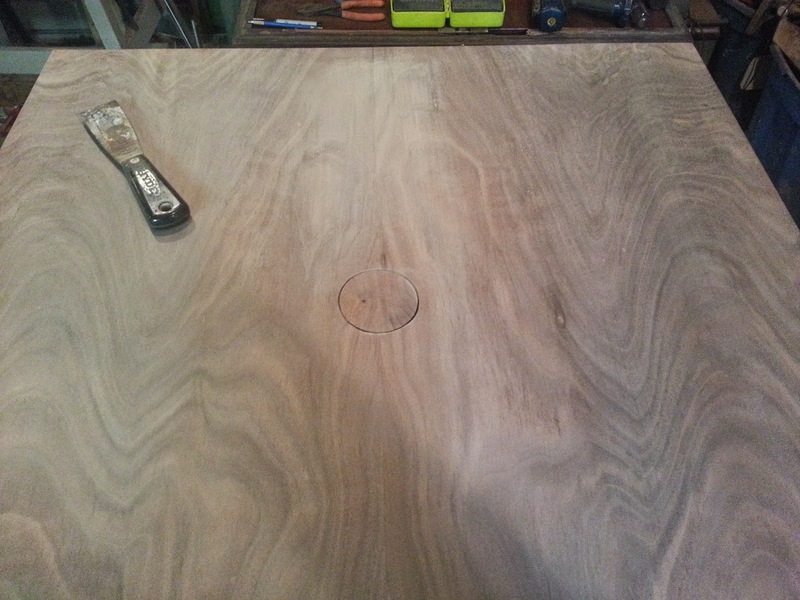 after locating the center I used a hole saw to make my cut, as seen in the next two photos. With the cylindrical box fully inserted, the top surface was flush with the top of the altar. A knife inserted around the perimeter loosens the top enough to remove it. 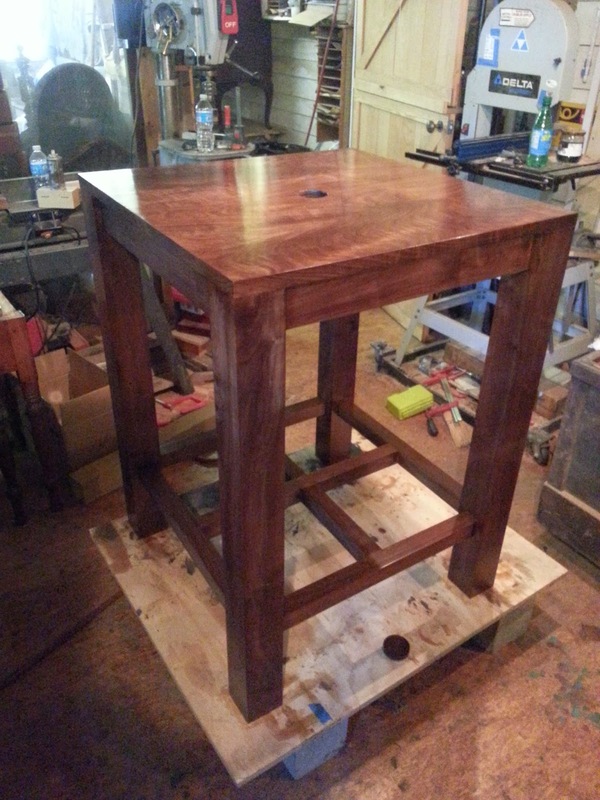 The base was glued in place and became part of the altar. This photo shows the completed altar. 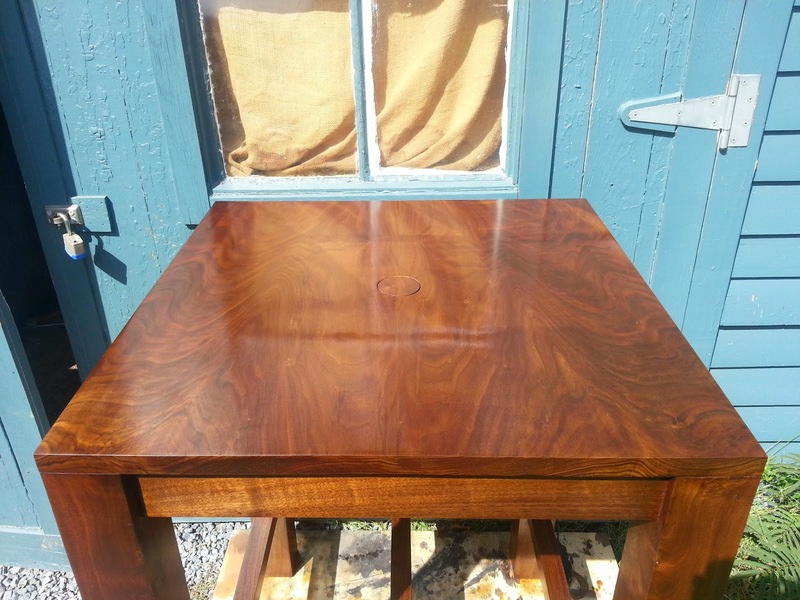 I lightly stained the altar to make the walnut look more consistent. 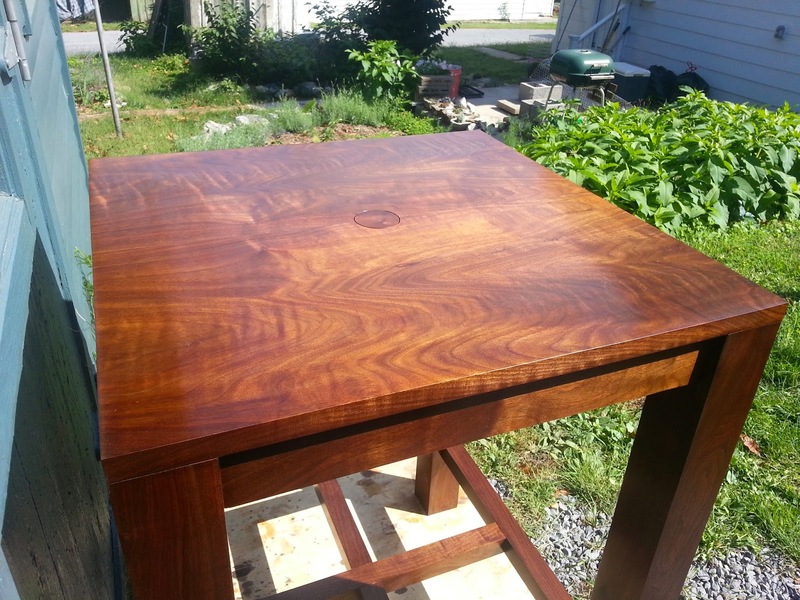 The stain also made the walnut "pop" . 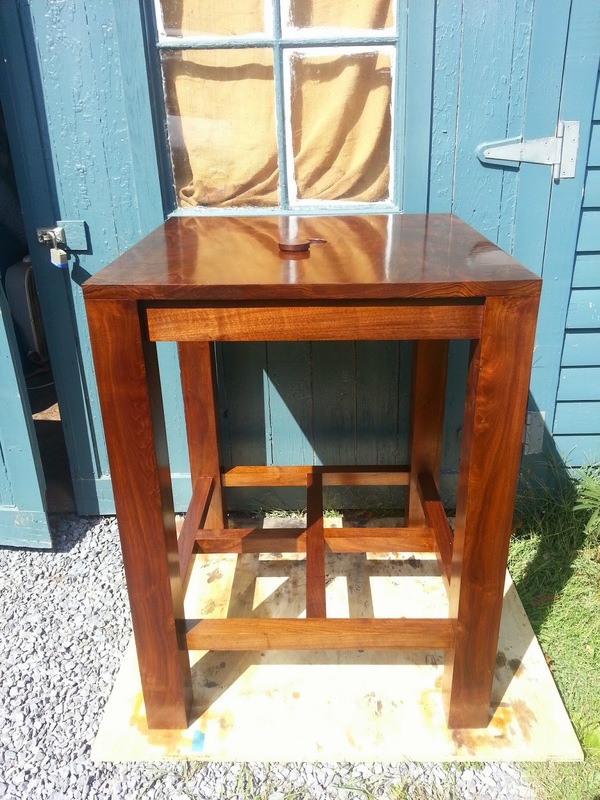 The following photo shows the altar after staining. 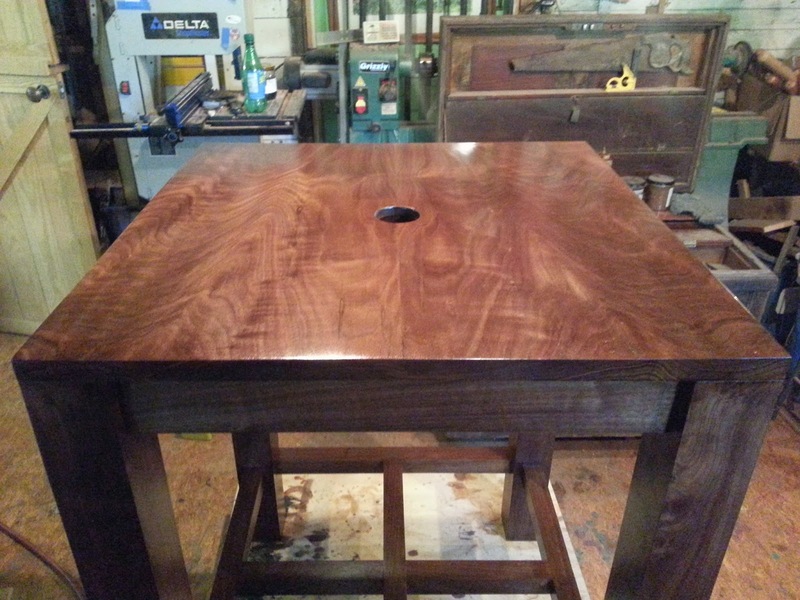 These next two photos show the altar during the finishing process. This one detailing the top shows the magnificent grain in the two bookmatched boards. The following photos show the completed altar, some with the lid of the reliquary in place and others with it removed. 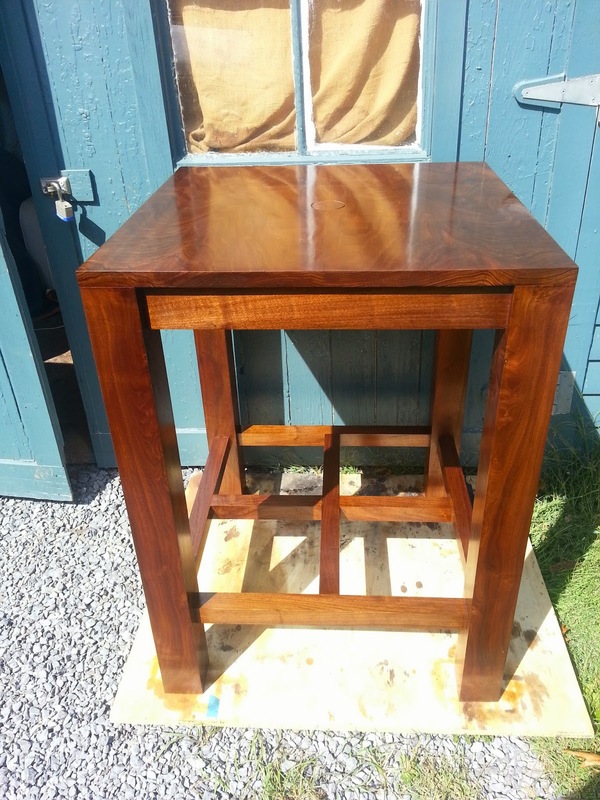 I was pleased with the results and felt that I had satisfied my desire to make this altar a thing of beauty that would serve the religious community it was made for for many years. I hope that I am right! Thanks goes to Rick Herbine of Herbine hardwoods (http://www.herbinehardwood.com/) for the beautiful timber with the exception of the legs, which came from my friend Brad Chandler.